Chances are you have never heard of Oruro. This nondescript city lies close to the centre of Bolivia, one of South America’s only two land-locked countries, Paraguay being the other. Bolivia is famous for two things: its charismatic president, Evo Morales, and coca. Evo, or Ebo, as Bolivians call him, is the country’s first indigenous president and has been in power for 10 years. His rise to power was aided by the coca leaf, for he was president of the coca producers association. The leaf plays a central part in Bolivia’s religious and cultural life. But it also happens to be the primary source of cocaine. Despite its relatively under-developed infrastructure, the country does attract a decent number of adventure tourists. Most go to visit the salt pans of Uyuni and the glorious sights of the Andes mountains. Even the traffic-choked La Paz, the world’s highest capital, receives its fair share of tourists. Oruro, located on the high tableland of South America called Altiplano, does not feature on the tourist trail though. The flat land and surrounding dry mountains provide a striking, though lonely, setting to the city. Even for Bolivians, Oruro only assumes importance once a year, during its famous carnival, or carnaval, as it is known in the country. Both culturally and geographically, this place is as far as you can get from India. So the last thing one expects is the presence of anything remotely Indian. Yet there I was, in a van named Colmillo Blanco (meaning White Wolfdog), in Oruro, sharing a ride with young Bolivian women dressed in traditional Indian costumes. “Sha-ruc Kaan," giggled a girl. Another shook her head vigorously in agreement. I had asked them who their favourite Indian actor was and clearly King Khan was miles ahead. “Hritik Ros-aan," yelled another one. “Raan-bir Sin," followed the one seated next to her. The three quiet boys in the van were divided between Deepika Padukone, Kajol and Madhuri Dixit Nene. We were all on our way to a party where these Indophiles were scheduled to perform Bollywood dance numbers. These youngsters were part of the growing clan of “Bolivia’s Bollywood Dancers". Little did I know that we were going to a party thrown by doting parents for their daughter, who had graduated from school. Such parties, I was told, were a common enough occurrence. Before Bolivia’s musica nacional took over, Salman Khan’s Aaj Ki Party ruled the gathering for a brief while. Surreal is probably the best word to explain the sight of Bolivians dancing to Hindi songs. And if I thought there wouldn’t be any latkas and jhatkas, I was mistaken. From the famous (or infamous) pelvic thrusts to emoting through the eyes, the performance had it all. The audience seemed relaxed, sitting back and enjoying the show. Antonio Quispe (in front) and his group at a graduation party in Oruro. “Kabhi Khushi Kabhie Gham was the first Indian movie I watched, way back in 2006, and I was hooked. The dance, emotions and colours mesmerized me. A couple of years later, I formed Indi-World. The first song we danced on was Pairon Mein Bandhan Hai," remembered the 30-year- old. The group, which now has about 30 dancers, is one of a few established Bollywood dance groups across the country. Passion defines both Indi-World and the evolution of Bollywood dancing in Bolivia. It was easy to see that Quispe and his students went to great lengths to keep dancing. It takes quite a lot of effort to recreate the costumes that we take for granted in India. Two of Indi-World’s dancers getting ready. The growing popularity of Indian dance has helped Indi-World. They were winners of the national championship of Danca-Indu, as it’s popularly known across much of South America, in 2014. And in a case of life mirroring art, it was the song Sadda Dil Vi Tu from ABCD that got them the title. The movie itself revolved around the trials and tribulations of a dance group and their eventual victory in a competition. 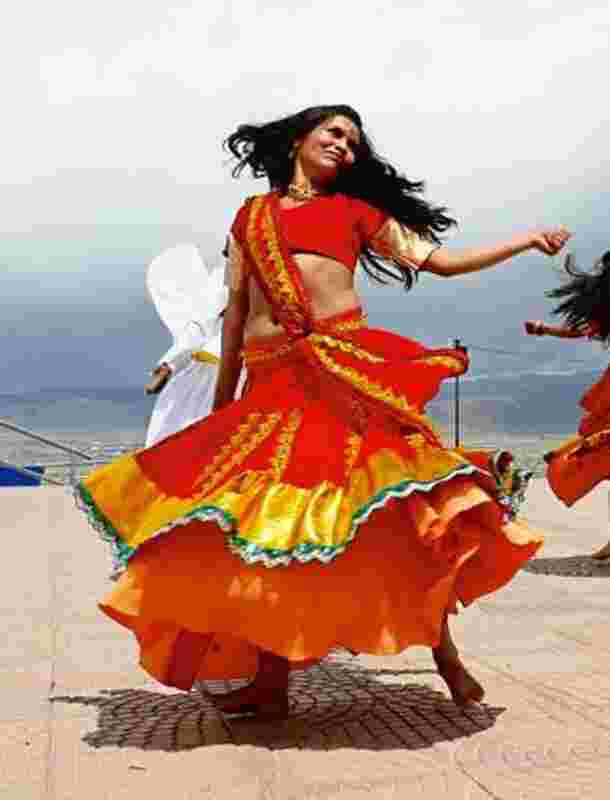 “There are quite a few good Indian dance groups in Bolivia. La Paz has Dil Deewana and Salaam E Ishq, Adab and Aaja Nachle. Cochabamba has a few as well, like Muskaan, Bhangare, Diversity Dance and Ra-One. Also, there is one from Potosí called Radha Bhajan," added Quispe. The winning team is responsible for organizing the following year’s edition. And as organizers, it cannot participate in the championship. Their love for Bollywood does not stop at classes, events or championships. Quispe and his students also perform on the city streets and recreate entire songs to make music videos. In fact, that was how I came across these fascinating dancers: Their rendition of SRK’s Marjaani song from the movie Billu caught my attention on YouTube. And despite the language barrier (Bolivians speak Spanish and I don’t), I decided to take the 3-hour bus ride from La Paz to Oruro to find out more about this interesting trend. Every week, Indi-World members wait for the English subtitled VCDs and DVDs of Hindi movies to arrive at the city’s market. Quispe or one of his friends then goes through the painstaking process of translating the English subtitles into Spanish for everyone to watch. SRK’s movies are the most anticipated, and they were mildly shocked when they heard that Dilwale hadn’t done too well in India. But does this art help them earn money? Quispe couldn’t help but laugh. “This is not a job; it is a passion. Both for me and my students," he said. And it was time for them to perform to songs from their current favourite movie, Goliyon Ki Rasleela Ram-Leela. The statue of the Virgin of Socavon, which is fast becoming the monument the city is identified with, may be an unlikely setting for a Bollywood dance number, but this was where the group was waiting to perform for unsuspecting bystanders. Built atop a mountain in Oruro, more than 3,700m above sea level, the statue can be reached by climbing 100-odd steps. When they began, everything stopped. For self-taught dancers, they were exceedingly good. I was the first Indian they had met but their beautiful Rajasthani costumes and graceful moves made it hard to believe that I was not in India. All I could do was admire their love for the art. Despite the scorching afternoon sun, all of them were dancing barefoot. By the end of the performance, most of them had developed blisters. But if they were in pain, they hid it well behind their smiles. As I prepared to leave and take the bus back to La Paz, Norma Manza, one of the senior students, said: “My only dream in life is to visit India someday and dance. I want everyone to know how much I love India and its culture." King Khan’s famous words from Om Shanti Om rang in my head, Itni shiddat se maine tumhe paane ki koshish ki hai... ki har zarre ne mujhe tumse milane ki saazish ki hai. Despite the odds, I am betting that Manza’s dream will come true. All she needs is a miracle, Bollywood style.